Bluffs Marina condos in Jupiter are Divosta built, 1,385 sq. 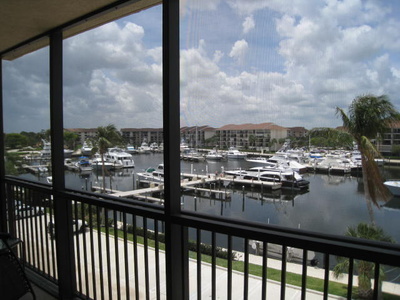 ft., 2 bd/ 2 bath units overlooking the marina. Perfect for avid boaters, onsite dockage is available up to 155 ft. The Bluffs consists of 22 - 4 and 5-story buildings with 660 condos in total with exterior catwalks and open parking. View an aerial site plan of Bluffs Marina, or research condos recently sold. Browse condominiums for sale in Bluffs Marina, or read more about the amenities and condo fees in this convenient boater's haven. The Bluffs Marina condos are just 1500 yards to the beaches of Jupiter. There are 3 community pools in the marina as well as tennis courts and Bocce Ball. Enjoy walking the marina docks and seeing some spectacular boats or in many cases yachts. In the evening the docks are lite and make for a beautiful evening view from you balcony while enjoying the sunsets. Bluffs Marina are pet friendly condominiums with a weight limit of 20 lbs. Trucks, vans or campers are not allowed. One assigned parking space and one guest space per unit. The condo fees in the Bluffs are very reasonable at $900 to $1,100 per quarter. Up to 2 rentals per year are allowed, with a 4 month minimum. 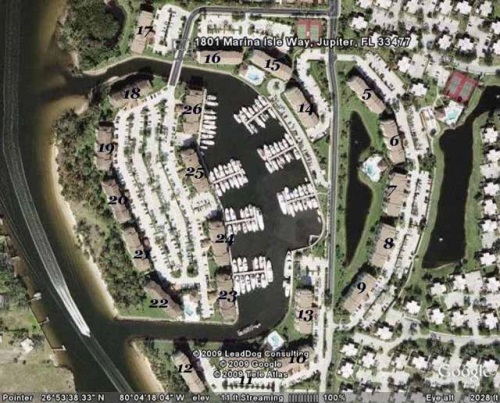 The Bluffs Marina condos are great values in waterfront condos here in Jupiter. They are well maintained and are a favorite with all. Besides the short ride to Jupiter or Juno Beaches which is always a favorite for all visitors the proximity to many other attractions is great. The Loggerhead Marine Life Center is right around the corner as is the Juno Pier which is fun to watch the fisherman and the surfers. Just up the street from the Bluffs is Publix shopping center which also has several restaurants, hair salons, banking and a Yoga studio. Downtown at the Gardens and the Gardens Mall, both excellent shopping destinations are 10 minutes away. The new Jupiter Harbourside Place is up the road a mile where you will find more Restaurants and the Jupiter Riverwalk. Boat and waverunner rentals as well as fishing charters are availabe at U Tiki by the Inlet bridge. Check out the Jupiter waterfront condos available in the Bluffs. If you have questions, or would like to view a condo in Bluffs Marina, please don't hesitate to email or call Jim at 1-561-744-7025 for assistance. Bluffs Marina Condos for Sale. Jupiter Oceanfront Condos by Jim McLane. See his profile on Google.